If you believe that you may have a claim against an estate, you will need to ascertain who is dealing with the estate. The persons dealing with the estate will either be named in the Will (the executors) or if there is no will or the Will does not detail the names of any executors, then these persons (personal representatives) will be determined by law. If you do not know whether or not a Will exists, you will need to find out and the best way to do so if you do not know who is holding the Will (which may be a relative, friend or professional) is to first consider whether the Will is registered online (for example, with Certainty) and secondly, to conduct a search of the probate registry to apply for a copy of the grant of probate. You can also conduct a search of the probate registry if there is no Will to obtain a copy of the letters of administration to identify the personal representatives. If order to obtain a copy of the grant of probate or letters of administration, you will need to know thefull name of the deceased, the deceased’s last permanent address and date of death in order to try and find out who the executors or personal representatives are. This information is easily identifiable from a death certificate. The General Register Office (GRO) website provides and online service and this will enable you to order a copy of a death certificate of a person whose death was registered in England and Wales. You can also use this service to help you research the family tree of the deceased. You can apply online or by post. If the person has died after 1858, then their record will be online. You can search and apply online for a grant of probate https://www.gov.uk/search-will-probate. The service costs £10. If you wish to apply by post, you can download and fill in form PA1S which is available on www.gov.uk. It costs £10 for a search, which includes a copy of the grant of probate and the will (if there is one) or letters of administration. The address that you need to send it to is on the form. If a general search has failed to provide any information, you can apply for a standing search which will remain “active” (i.e. it will search the Probate Registry for a grant of probate) for six months. If a grant of probate is issued during the six month period, the Probate Registry will send you a copy of the grant (and any Will) enabling you to liaise with the personal representatives or executors. To apply for a standing search, download and fill in form PA1S from www.gov.uk. If a grant and Will (if there is one) is issued in the next 6 months, you will receive a copy. The cost is £10. If the standing search expires, you can continually renew your application. A further fee will be payable for each renewal. A caveat prevents a grant of probate from being issued by the Probate Registry. There are only a number of circumstances when this procedure should be used and the following examples are not intended to be an exhaustive list. If you believe that you have a dispute then we would suggest that you consider taking legal advice as soon as possible. Examples of when a caveat may be used? If you suspect that the Will that is being admitted to the Probate Registry is not the last Will of the deceased. If you believe that the deceased did not have capacity when the Will was made. The Will has not been properly signed or witnessed. There is a dispute as to who should apply for probate. How to I request a Caveat? A written request is sent to the probate registry using a form PA8. There is a fee payable to Her Majesty’s Courts and Tribunals Services (HMCTS) of £20. The caveat lasts for a six month period and prevents the probate registry from issuing a Grant of Representation. You can renew a caveat application in the month before expiry to ensure that you are afforded as much protection. What happens if a request for a Grant is received by the Probate Registry? The person applying for the grant of probate will be contacted by the probate registry and advised that there is a caveat preventing the issue of a grant of probate. This may then force the persons dealing with the estate to take steps to "warn off" i.e. try to remove the caveat. You will then be required within 8 days to state your interest in the estate by putting in an "appearance". The caveat can be removed by the probate registry if you fail to take any steps. If you enter an appearance the caveat will remain in force indefinitely until matters are finally resolved. The probate registry will expect the parties to take steps to resolve any dispute. You or the person applying for a grant of probate may issue a summons which will be heard by the District Probate Registry. The alternative is that you or the person applying for a grant may commence a probate action. If you are considering entering a caveat we would suggest that you take legal advice as to whether or not you have a claim against the estate. There are cost consequences with regards to any formal proceedings which you will need to consider carefully before entering into any dispute. For further advice and help please do contact Dispute A Will on 0800 975 2166 or email via the contact page . Distribute the estate to the beneficiaries correctly entitled either under a valid will or on intestacy. Sometimes executors and administrators do not do their job properly as a result of which the estate suffers loss. In particular their may be a failure to collect in assets or realise them quickly or they may be sold at undervalue. Alternatively there may be a failure to correctly identify beneficiaries or there may be unreasonable delay in distributing the estate to beneficiaries. Executors and administrators do owe a duty of care to the estate and to its beneficiaries. If they breach it they can be personally liable for the consequences of either maladministration or misappropriation. At Dispute a Will we can assist you in dealing with executors and administrators if you believe they are not doing their job properly or are acting in a way that will cause you loss. The role of the Mediator is not to make any determination of conflicting evidence or of legal principles or advise either party as to their respective positions. The sole role of the Mediator is facilitative to put in place a structure to help the parties work towards a settlement. Mediation is an entirely voluntary process and remains so until such time as a binding settlement is reached. Timing - a Mediation can generally be organised within a matter of weeks; Court Proceedings can take years. A Mediation can be held before Court proceedings are commenced or before a dispute has escalated out of control. Cost – a Mediation generally involves preparation of a few days plus up to a day for the Mediation itself. Court proceedings are renowned for a significant cost outlay. Confidentiality – A Mediation is entirely confidential, and the parties can agree to keep the outcome confidential and so avoid setting unhelpful precedents . Court proceedings are in general conducted in the public spotlight unless the Court orders otherwise. Stress – Court proceedings can be stressful and time consuming. Mediation is more informal, and the Mediator will attempt to redress any imbalance between the parties to ensure that a party who is unfamiliar with dispute resolution procedures is on an even footing with a more seasoned litigator. Flexibility and stronger outcomes – A Mediation traditionally will produce an outcome for both parties that is win-win. Court proceedings tend to produce either a win-lose (where there is only one winner) or lose-lose outcome (where neither party comes away with a positive result). A win-win solution makes it easier to preserve good working relationships between the parties or alternatively it can make the termination of relationships more amicable. A settlement can for example include provision for public statements or an apology, but for instance in a professional negligence claim, in a way that enables a professional reputation to remain intact. It can also lead to agreed structured payment terms, or the restructuring or renegotiation of an existing contract, or wider business activity between the parties. Settlement – The vast majority of mediations produce a settlement where the parties are genuinely committed to the process. If they do not settle, sometimes the effect of the Mediation is act as a catalyst for the dispute to resolve shortly afterwards. The short answer is that it is not a sign of weakness. In fact it is quite the reverse. Experienced businesspeople tend to have a clear focus on what they want to achieve for their business and the dispute must be seen in that context. Litigation can be uncertain and early resolution of a dispute through Mediation makes good business sense, particularly with the added control that the parties have over the outcome. 1. The parties either through their lawyers or directly between themselves will agree to jointly appoint a Mediator. The Mediator will be entirely independent of either party. 2. The parties will sign a Mediation Agreement, governing the conduct of the Mediation including for instance confirming that all discussions and documents used in the Mediation will be are treated as confidential and "without prejudice" and will not be used in later proceedings if the mediation does not settle. 3. The costs of the appointment of the Mediator are normally shared equally between the parties, as are the costs of any room hire and refreshments. 4. Before the Mediation, the Mediator will speak to the parties and agree what papers are to be available on the day and agree any other relevant arrangements. This is to help make best use of the available time at Mediation and to ensure that the parties understand their responsibilities. 5. The parties (including everyone with authority to settle the dispute) will attend the Mediation. The Mediator will invite the parties to make an opening statement to each other (this tends to be read from a script) and in this statement give its perspective on the dispute and highlighting points of particular concern. The parties will then break out into separate meeting rooms to hold a series of confidential meetings with the Mediator. 6. In those meetings, the Mediator will work with each party in turn in order to discuss the problem. These discussions are entirely confidential, and this encourages the parties to be frank with the Mediator with total confidence that any weaknesses or private concerns that they may have will be not be communicated to the other party, and with this spirit of openness, the Mediator can help each party to have a critical and realistic examination of their case in private session, helping each party in their understanding of the strengths and weaknesses of their position, as well as the potential for loss, expense, time, distraction and uncertain court outcomes. 7. During the course of the private meetings information may emerge which the Mediator may consider would be helpful to disclose to the other party in order to move the matter forward to settlement. The Mediator will first ask for the express authority of the party to disclose such fact, and this may help the parties to build a better understanding as to the root causes of the dispute. 8. The process will continue until either it reaches a settlement, either party decides to withdraw, or where it is clear to the Mediator that any impasse cannot be broken. 9. If a settlement is reached, a binding agreement will be drawn up that will be signed by the parties in a final joint session. If someone dies without making a Will they are said to have died “intestate”. 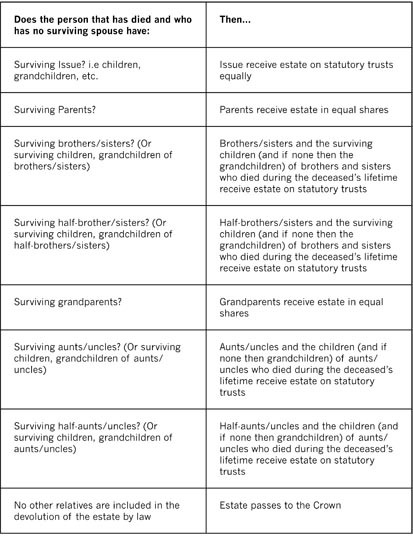 If a person dies intestate their estate and possessions are shared between surviving relatives according to fixed rules set by law. These are known as the intestacy rules. If a person dies without leaving a valid Will then the law decides how their estate and possessions will be distributed. Many people assume that if they die without making a Will, all of their assets and possessions will pass to their spouse or long term partner. Unfortunately, this is not always the case. It may mean that someone you do not wish to benefit from your estate will do so whilst others who you do wish to benefit, for example, stepchildren and co-habitees, will be left with nothing. The following is intended to provide general guidance on the intestacy rules. If a person has a surviving spouse, the intestacy rules depend upon when that person died. If the person died before October 2014 and had a surviving spouse, then you need to establish whether or not that person had any children (known as issue – issue means all direct descendants of that person i.e. children, grandchildren, great children and so forth) and the value of the estate. If the person had a surviving spouse and children, then provided the net estate is worth less than £250,000, the spouse inherits the whole estate. If the estate is worth more than £250,000, then the spouse inherits all personal chattels, receives £250,000 and has a life interest in half of the remaining balance (which reverts to the children on the death of the surviving spouse). The other half of the remaining balance passes equally to the children who survive and reach the age of 18. If a beneficiary who would have been otherwise entitled dies before the deceased but leaves children of their own then those children will inherit the share of their deceased parent. If the person had a surviving spouse and no children and their estate is worth less than £450,000 then the surviving spouse inherits the estate in its entirely. If the estate is worth in excess of £450,000, you will then need to establish whether the person had surviving parents, and if none, any surviving brothers and sisters, and if none whether those brothers and sisters had any children and so on. The surviving spouse then inherits £450,000 in addition to the personal chattels, and the balance of the estate is then divided in two with one half passing entirely to the surviving spouse and the other half passing to surviving parents equally (if two) and absolutely, and if none brothers and sisters equally and absolutely and so on. Please refer to the section titled “no surviving spouse” and follow the table for the full list of potential beneficiaries. If the person had a surviving spouse and no children, their estate passes to their spouse in its entirety. If the person had a surviving spouse and children, the spouse receives the first £250,000 of the estate and then the balance of the estate is divided into two. One half of the remaining balance passes to the spouse absolutely and the other half of the remaining balance passes to issue on statutory trusts. If a member of a class dies before inheriting then their children will inherit their deceased parent's shares. If a person dies and they do not have a surviving spouse, it does not matter when that person died, the estate will devolve in the following way. If the person had surviving issue, those children or grandchildren receive the whole estate on statutory trusts in equal shares, and if there are no issue, the estate passes to a person’s surviving parents in equal shares. If no surviving parents, please refer to the table below. To use the table below, which is provided as general guidance, if the answer is yes, look to the right of the chart as to how the estate devolves and only if the answer is no, move to the following line. The simple answer is “Yes”. Every adult should make a Will preferably with a reputable firm of solicitors, and review it regularly, particularly if their circumstances change, such as they get married, have children or get divorced. The main reason is so that you can decide who should benefit after your death rather than allow the above intestacy rules to decide it for you, as they may not suit your circumstances. You decide as to who should benefit from your assets after your death, rather than allowing the intestacy rules to decide for you. You can name individuals, who can be professionals specialising in the administration of estates, to deal with your estate after your death. If you do not, this is determined by law. You can ensure that your estate is dealt with in a tax efficient manner. You are likely to reduce the possibility of any challenge to your own estate if you have a Will determining how you want your estate to be dealt with after your death. A solicitor will carefully document the reasons for your decisions and can advise as to possible challenges. If you are reading this guide because someone close to you has died without a Will, you must first determine whether you have any right to act and administer their estate i.e. act as personal representative. If you require assistance please do contact us. If you are not entitled to act as a personal representative, or are not happy with the entitlement you have, we can advise as to whether it is possible to vary who benefits under intestacy. If, under intestacy you feel that reasonable financial provision has not been made for you, then you may have a claim for increased financial provision under The Inheritance (Provision for Family and Dependants) Act 1975. Please refer to our separate guide for claims of this nature. For any further information on intestacy or any other matter regarding wills, trusts or probate please contact our Private Client Department.